For Phoebe Dahl, advocating for children isn't just a calling; it's the family business. Her grandfather, beloved Charlie and the Chocolate Factory author Roald Dahl, taught generations of underaged underdogs that no situation was so hopeless it couldn't be overcome with wit and cunning. Legacy in hand, the younger Dahl founded Faircloth & Supply, a Los Angeles–manufactured clothing label with a charitable slant. For every minimalist linen garment sold—think Eileen Fisher for the millennial set—the company donates school uniforms, supplies, and a year's stipend to a young girl in Nepal, where education is a luxury for many families. Something's obviously working: In 2014, Faircloth helped send 900 girls into the classroom. Ecouterre recently caught up with Dahl to pick her brain about her love of Nepal, her cri de coeur, and the changing face of philanthropy in fashion. Why did Faircloth choose Nepal as the focus of its mission? It started with the cause: girls’ education. I have always been very passionate about women’s rights and the importance of educating girls around the world. I was insistent on finding an organization that focused on girls education and human trafficking. I also wanted to work with a grassroots organization so I could be more hands-on and create the opportunity for us to grow together. I asked everyone I knew and was eventually connected, through GO Campaign, to Mahesh, who is the founder of General Welfare Pratisthan, which happens to be in Nepal. We had an instant connection, so I pitched him my idea about giving a school uniform for every dress I sold and he loved it. It has now evolved into two school uniforms, school supplies, and a one-year scholarship for each garment sold. Nepal is such an interesting country. Most foreigners think it’s beautiful and mountainous and some sort of utopia, but it borders India, has a lot of the same social issues as India, and does not get a lot of help. In fact, as a result of being so close to India, traffickers will cross the border from India into Nepal in search of girls to bring back. 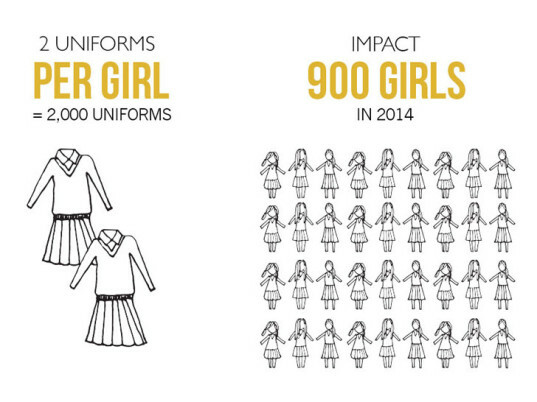 How does providing school uniforms to girls empower future generations? In Nepal, all students are required to wear uniforms, in order to neutralize caste discrimination. If a young girl cannot afford a uniform, she is unable to attend school. In most developing nations, girls are perceived as objects and even sold by their parents—including their mothers—into human trafficking. Because they’ve been dealt the wrong cards, they’re rarely given the opportunity to attain an education or furthermore a life. By donating a uniform, you give a girl a chance. Through her education, this young girl is one step closer to lifting struggling economies out of poverty. Girls who receive an education are less vulnerable to HIV infection, human trafficking, and other forms of exploitation. They are more likely to marry later, raise fewer children (who are more likely to go to school), and make important contributions to the family income. This positive outcome transcends generations and can potentially lift whole communities out of poverty. Let’s talk about Faircloth from the design perspective. What inspires you? I’ve been very inspired by traditional Japanese folk wear from the early 1900s; everything from the cuts to the colors is just delicious to me! Each piece is made of a an array of different indigo-dyed ikat fabrics, sewn together by hand into a masterpiece of patchwork. The Japanese—then and now—are my biggest inspiration. Everything from the busy patchwork, to simple, white linen pieces. Faircloth is a seasonless women’s collection loosely based on one material: linen, a fabric that can lead many lives and tell many stories. Our inspiration has always been found fabric, heritage textiles, and antique treasures, such as French linens and old Japanese indigo-dyed utilitarian wear. Through this inspiration, we concoct a creation that embodies grace, elegance, and comfort. All of our pieces feel soft and worn, ready to be thrown together with anything and everything. We pride ourselves in producing quintessential pieces that we hope will live, love, and travel with you. What sustainable practices does Faircloth employ? We use a mixture of linen, which is an organic fabric, and deadstock fabric, which is discarded fabric from fashion houses that gets passed down to “jobbers” in L.A. who then resell the fabric. This is incredibly resourceful as it would normally get thrown away—such a waste! I never discard any clothing. If I have any leftover pieces from a collection, I’ll upscale them and transform them into something else that is more sellable. For instance, I’ll take a Spring/Summer piece and dye it in winter colors, or I’ll change a hemline, add sleeves, or add elbow patches. I find it fun. I’m incredibly crafty, so it’s almost a hobby of mine to see how much I can do with a little amount—and it’s a lot! Will philanthropy in fashion some day become the status quo? I already see it everywhere—it’s become a trend, which is incredible. Some might debate that “trends” aren’t a good thing, but I’m all for whatever makes these social issues real for people, trend or not! I want to shine a light on how bad the sweatshop working conditions are Asia. Because low wages are so competitive, raising minimum wages for overseas workers feels like an impossible battle. The garment-maker only receives 3 percent of the cost of most clothing, which, in many cases, is no more than 25 cents. If, as a small independent clothing line, I can incorporate $12 into my cost, then larger companies can absolutely pay more than 25 cents. The consumer wouldn’t even notice the increase, and it would change the lives of million of garment workers. Fair wages, decent working conditions, and transparency are key priorities in all stages of our production. How does Faircloth’s social consciousness extend to its clothing and uniforms? Faircloth & Supply aims to create a sustainable livelihood for those we work with by creating economic and creative opportunities. We want people who buy Faircloth & Supply to know that the garments have been handmade at a grassroots level in the United States in collaboration with small-business owners. We also want them to be assured that fair wages, decent working conditions, and transparency are key priorities in all stages of our production. The uniforms Faircloth & Supply donates are made by our own graduates. The donations made by Faircloth & Supply allow the children to attend school, thus completing a vocational training in sewing. The students then sew the uniforms that Faircloth funds, enabling a new generation of girls to attend school. It comes full circle. The wages are decided upon by our local partner in coordination with the self-help groups: the women themselves. They’re paid fair wages and include access to further education and services. I hope to have girls support and education centers scattered around the world in strife-torn areas around Asia, Africa, and South America. These centers would be for strong-headed, career-driven women and girls in need of support and safety. I would provide them with the necessary training in whichever aspect in the clothing production process they choose. Anything from fabric weaving, dying, printing, sewing, leather-making, beading…whatever is indigenous to their culture. For example, Asia would produce our beloved linen dresses; Africa, magnificent two-piece suits in bright and bold textiles; and South America, beautiful woven bags and shoes. Everything will be made by women who live in economic strife and lack opportunities to lift themselves and their families out of poverty and into society. Dahl says she has always been passionate about women's rights and education for girls. The GO Campaign connected her with the founder of founder of General Welfare Pratisthan in Nepal. "We had an instant connection, so I pitched him my idea about giving a school uniform for every dress I sold and he loved it," Dahl tells Ecouterre. "It has now evolved into two school uniforms, school supplies, and a one-year scholarship for each garment sold." To guard against caste-based discrimination, all students in Nepal are required to wear uniforms. If a girl's family cannot afford to buy her a uniform, she can't attend school. “By donating a uniform, you give a girl a chance," Dahl says. "Girls who receive an education are less vulnerable to HIV infection, human trafficking, and other forms of exploitation. They are more likely to marry later, raise fewer children (who are more likely to go to school), and make important contributions to the family income."